Earlier today, I tweeted that I didn’t agree with the Democratic Alliance’s (DA) strategy of no longer recognising the Speaker of Parliament. Besides wondering quite how this could be effected, I also suggested that gambits aimed at breaking the Parliamentary process hardly seemed appropriate for an already broken institution. A friend on Twitter asked what I would suggest as an alternative to what the DA has chosen to do, and this is my answer to him. Well, an answer, and also some reflection on the situation in general. I’m not going to rehash what happened in Parliament yesterday, and will instead point you to Rebecca Davis’ column, which does a fine job of highlighting what a unfortunate session of Parliament this was for anyone who holds out hope that our nation’s affairs are being governed by reasonable people. Events in Parliament yesterday represent a turning point for our democracy and has fundamentally changed the DA’s approach to Parliament. Baleka Mbete lost control of the House and destroyed her credibility as the Speaker. Accordingly, we will cease to recognise her authority as Speaker. Every time she presides over the House, the DA will only send its Chief Whip, Deputy Chief Whip and those members participating in debates. By “fundamentally changed”, Maimane seems to mean that they intend to read the mandate that many South Africans have given them to represent them in Parliament, vote on bills, hold the Executive to account and so forth, as giving them licence to rather take their toys and go home. Because instead of a potential 89 (the number of DA representatives in the National Assembly) (NA) voices, there will now only be the handful described in that last paragraph, quoted above, and the 22.2% of South Africans who voted for the DA might as well have “fundamentally changed” their attitudes towards elections also, and not bothered to vote. Yes, I get that these are tactics of brinkmanship, where the DA might hope that the pared-down Parliament resulting from this move might provoke the ruling party into fearing a loss of perceived legitimacy in respect of the National Assembly. But if what you’re complaining about is a ruling party that you think above the law, and contemptuous of the opposition, how likely do you think a favourable result is? More important, for me, are some matters of principle. One, as I’ve already noted, is that DA MPs have a job to do, and their Parliamentary Leader is telling them not to do that job. Second, tactics like walk-outs (and this is basically an extended and generalised walk-out) need to be used sparingly. A walk-out is one of the strongest protest signals the opposition has, and one doesn’t want to use your strongest currency without exhausting all other options. Now, in this case – given that riot police were in Parliament, assaulting MPs and so forth, a walk-out might well be the appropriate action. Except, they do it all the time – not just the DA, but other parties too. So, instead of provoking as significant a reaction as it should (“What? All the elected officials of party X, paid R1-Million a year to do job Y, have walked out of Parliament? Either there’s a crisis, or they need to explain themselves. Either way, I care.”), one instead thinks of the boy who cried wolf, and what rhetoric Maimane will need next time he wants to lead a walk-out. Which will probably be next week. Walk-outs can be an abrogation of your responsibilities to the voters. They can also impair credibility, not only because credibility can be impaired inside the NA but also with the electorate, some of whom still associate the DA with negativity and obstructionism. 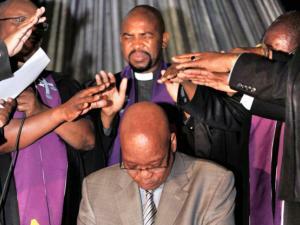 But we can, and do, object to the fact that he is subjecting the South African Parliament to a political stunt. His actions demean the national legislative authority of the Republic of South Africa. It’s different when we do it, I guess. Third, some of our conventions only have moral force through common assent – they’re grounded in a sort of social contract, where they work because we all agree that they should work in a certain way, and are valuable because they often, in fact, do so. Maimane is dead right that Mbete is a terrible Speaker, who has utterly failed to hide the fact that she’s defending the ruling party’s interests wherever and whenever she can. She’s a disgrace to the position, and needs to be gotten rid of. But, according to the rules, if she tells you to leave the NA, you need to leave the NA. And when she told Michael Walters (deputy chief whip of the DA) to sit, and then to leave after he refused to sit, it’s the DA who break that social contract. The DA can’t claim a moral high-ground involving Mbete and the ANC provoking the violence of yesterday, without reflecting on the fact that there were various provocations along the way to that – and that some of them involved the DA, and specifically involved the DA ignoring the same set of conventions that they want Mbete censured for ignoring. There are differences of degree, no question – as I say above, I’m addressing matters of principle alone, and making the point that it’s not only the ANC who is breaking the relevant social contract. If told to leave, you leave, and use the fact that you were capriciously ejected as ammunition for future battles, rather than running the risk of your refusal prompting an even less productive session for your colleagues, and the citizens you represent. To conclude, and in part-answer to the question that prompted this column, what would I have suggested instead of what Maimane says in his statement? Well, I suspect that I would have written a far more strongly worded letter, which would have made it clear that the party no longer recognised her moral, rather than her literal, authority. I would perhaps have embarrassed her with a list of all the ways in which she’s let the NA, and the country, down, and highlighted moments in which she destroyed her credibility – in short, the purpose of the press release would simply be to demonstrate that she’s demonstrably not fit for purpose. It would have been just on that topic, not about Zuma not attending question and answer sessions, or Lindiwe Zulu attacking an opposition MP, so as to make it clear that as far as you were concerned, this Speaker is contemptible. Then, I would have told my caucus to get back to work, including respecting the Office of the Speaker, and including obeying instructions that the Speaker gives. If the party thinks they contravene the agreed conventions (and laws), then the people not ejected can make that point, sometimes winning and sometimes losing. But at least the majority of the MPs will be in the House, able to do some work. Seeing them do that work in a dignified fashion, working within the rules, while simultaneously observing a Speaker making rulings that are biased, arbitrary and perhaps vindictive, might well do more good for both Parliament, and the DA’s share of the vote. It’s perfectly reasonable to be dissatisfied with the electoral process. We might struggle to find a voter in any jurisdiction who can’t present a case for how things could be better, whether the improvement were to come from revisions to party funding legislation or the accountability of elected officials to those of us who elect them. And, grumbling is what we do – all the more since the Internet and social media allowed for vastly increased numbers of people to join in the grumbling. But for all the grumbling, it’s perhaps worth thinking about – or revisiting – what the point of electoral systems in democracies is. But the dissatisfaction leads some to say we should simply opt out, either through not voting at all, or through measures such as spoiling your ballot. Recently, Ronnie Kasrils has been reported as recommending spoiling your ballot as a way to indicate that you believe our current ANC government has let us down (though, more nuanced accounts of his statements to the media indicate that he’s recommending a vote for a minority party first, and only spoiling your ballot if none of those parties are palatable to you). To make one thing clear: spoiling your ballot is a legitimate choice in a democracy. But it’s the wrong choice, because it misunderstands the point of voting, in that it begins with fealty to a chosen party, where that fealty allows you to either endorse the way that they are doing things, or instead, to simply withhold your support from them. The right choice is to understand your vote as purely a tactical gambit, deployed in the manner that might best achieve the outcome you hope to achieve. Signalling disappointment with a political party isn’t effectively signalled through spoiling a ballot, in that the signal is far too noisy – in brief, there is no way of telling whether you spoilt your ballot because you’re incompetent, or because you were protesting the electoral system rather than the party you ostensibly didn’t vote for. A vote for an opposition party shifts the balance of power, however minutely. Voting for nobody, by contrast, indirectly rewards the incumbent through denying an opposition a chance to govern – especially when dealing with a significant majority such as the one the ANC enjoys in South Africa. A spoilt ballot might well decrease the majority party’s proportion of votes cast, but a vote for an opposition party will decrease it further, and alert them to the fact that they cannot take your vote for granted in a far more transparent way. The tactical element of each person’s vote is of course a matter that can only be clarified by the individuals themselves. For a middle class liberal type like myself, living in the Western Cape, a vote for the ANC in the provincial ballot might play a part in alerting the governing party (the Democratic Alliance, or DA) that their steadily increasing social conservatism is diametrically opposed to liberal ideas. 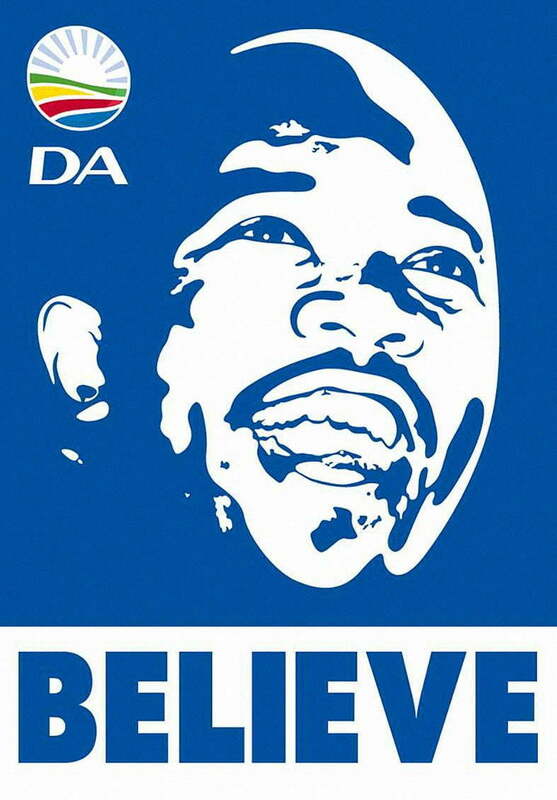 On a national level, a vote for the DA might well be the best signal of disaffection with the ANC – but then again, a vote for someone like the EFF might be more effective in the long run, because both the ANC and the DA are roughly centre to centre-right in economic terms, and the voice that’s missing in a poverty-stricken country like ours is the leftist one. Having a strong EFF presence in Parliament might be just what’s needed to shake the incumbent from their dogmatic slumbers, to paraphrase Hume. And then, next election, you get to make the same choices again. The key thing to remember is that they are choices, and that you owe nobody your loyalty. If it’s the long-term future of the country that you care about, then you should vote in the manner that you think best supports a prosperous future for the country – not in a manner that best supports a prosperous future for any particular party. Over the weekend, I had a chat with a man from Nkandla (who will remain anonymous). As you no doubt know, that’s where Jacob Zuma is building his palace private residence, and it’s also the place that his own spokesperson (Mac Maharaj) didn’t want to visit because he feared he’d be unable to defend it once he had (at least, if you trust the interview recorded in Richard Calland’s book, The Zuma Years). We didn’t talk about the residence, but I suspect that this man from Nkandla would be opposed to the deception surrounding the expenses incurred there, as well as the quantum of the expenses. Another point of agreement between us was with regard to the irrelevance of the number of wives Zuma has, both in terms of his political credibility, as well as to negative judgements regarding what Zuma costs the people of South Africa. The political credibility part is less controversial, and unless you insist on monogamy for whatever reason, I imagine you agree that this shouldn’t impact on our judgments regarding Zuma (assuming, of course, full volition on the part of the wives and so forth). As for the costs incurred on the public purse, my interlocutor and I agreed that if the law allowed for polygamy, and for public support of the President’s wives, then it’s the law that needs to change, rather than Zuma that needs to change. One could argue that Zuma should set the example, and defer the marrying of anyone other than who he was already married to (when taking office) until after leaving the position. But this would mean a less than full acceptance of Zuma’s cultural values, and would to my mind run contrary to the cultural inclusivity our Constitution demands. It would be an assertion that norms other than Zuma’s were standard, and that he’s allowed to contravene those – and practice his own, (implied) aberrant or inferior culture, so long as it’s done in a way that’s convenient to the rest of us. It may be that we don’t want to be as culturally inclusive as the Constitution demands. But that’s not the argument here – instead, this would be an instance of insisting on the primacy of a particular set of norms under the guise of financial concerns. Instead, we should say that financial concerns disallow one set of cultural norms from being as well supported as others (if we wanted to be honest about the matter). Or even more honestly, we could say that culture X is somehow inferior to Y. But until we do either of those things, the point is that it’s not Zuma’s problem that his wives cost more to support than Mbeki’s did. He could act in a supererogatory fashion, and choose to save us all some money, but he’s under no obligation to, and we shouldn’t judge him more harshly if he doesn’t choose to save us that money. That, at least, is what the man from Nkandla and I agreed over the weekend. If you don’t respect those in leadership, if you don’t respect authority then you are bordering on a curse. Whether we like it or not, God has made a connection between the government and the church. That’s why he says you, as a church, should pray for it. It’s easy to say that he’s appealing to a lowest common denominator here, in that an estimated 80% of South Africans are Christians. But this goes further than simply drawing on the support of like-minded people in claiming that he is “doing God’s work”, for example. This is divisive and judgemental (on spurious, metaphysical grounds, rather than principled ones), in that he’s threatening voters who might be tempted to vote for someone other than the ANC with being cursed. Contrary to the entire point of the democratic process, whereby we freely choose our representatives based on their positions and performance in delivering what they promised us, here your mortal soul is in danger if you don’t vote ANC – regardless of positions or performance. Even if Zuma believes this to be true, threats that would be more suited to Medieval times are surely unbecoming of the President of a nation? Furthermore, the opportunism of the rhetoric is perhaps even more clear in the next sentence, where he asserts that God has made a connection between “the government and the church”. By this, he has to mean that this government is looked upon with favour by a particular (his) god. He can’t mean God smiles on “governments” in general, because then God must also have approved of PW Botha’s government; and he can’t mean that God is only “connected” in some non-judgemental way to governments, because if so, what’s the point of highlighting an arbitrary connection, even as you say voters should pray for the government? In today’s Business Day, Peter Bruce wonders “how much more can the ANC take“. While Bruce mostly addresses the political processes by which Zuma could be ousted as the ANC leader, this question can also be raised with respect to those who vote ANC. As he did in 2011, he’s blackmailing voters into supporting him through claiming that it’s only through him, and his party, that their souls will be safe. Note: Those who have already read my earlier post on this subject might want to skip this column, as there is a significant overlap in content (around 90%). The text below represents an attempt to make my key concerns more evident, and is the version submitted to The Daily Maverick for my column this week. A few weeks ago, my (occasional) fellow Opinionista Victor Dlamini Tweeted a link to an IOL report describing an instance of apparent racial profiling at the V&A Waterfront in Cape Town. The conversation which resulted should surprise no one at all, in that it consisted of the usual mix of protestation from Capetonians eager to refute the notion of Cape Town being a racist city, alongside various endorsements and examples of such racism. Now that the local government elections campaigns are behind us, it is perhaps possible to discuss this issue more productively. Whether Cape Town fits the stereotype or not, it’s useful for the ANC to perpetuate the stereotype of Capetonian racism, as they enthusiastically did in the matter of Makhaza, as well as on several other occasions, however slight the opportunity to do so actually was. Well, they at least thought it useful – the election results could well indicate a greater agnosticism on this issue. But the politicisation of the issue tends to polarise opinion, rather than clarify the issue. So, one could start by pointing out that to say that Cape Town is a racist city does not mean that everyone in Cape Town is racist. It certainly does not mean, as ANC spokesperson Jackson Mthembu alleges, that the governing party of Cape Town and the Western Cape is racist. I don’t believe that they are, and I also don’t agree with interpretations of events like the Makhaza toilet case which are used to support this claim. Furthermore, it’s also perfectly understandable that the DA would protest claims that Cape Town is inherently racist – pointing to the diversity in the party, service-delivery successes, and Cape Town’s relatively low (compared to the other metro’s) Gini coefficient. Lastly, it could be expected that many white liberal sorts (such as myself) would feel offence as a result of such claims. But as I’ve frequently argued, offence is no guide to the truth, and also shouldn’t be used to drown out noises you don’t like hearing. While it is of course true that there are racists everywhere, this doesn’t preclude the possibility of Cape Town containing a higher proportion of them, or for some Capetonians to be in denial as to how enlightened they actually are. If so, then it would make sense to say that Cape Town is ‘a racist city’, by comparison to other relevant South African cities. And of course there are cities that are more racist than Cape Town – Orania would be a possible example. But despite all these disclaimers and qualifications, when compared with our other capitals or other major cities in South Africa, we certainly hear more stories about racist encounters or instances of perceived racism emanating from Cape Town. Perceptions are not always true. Stereotypes can be perpetuated, sometimes through evidence, and sometimes through prejudice. It’s possible, for example, that the trope of a racist Cape Town is a simple consequence of jealousy, in that Northerners (and the ANC) want to find fault in what seems – on the surface at least, and also to many of those who live here – to be the best place in South Africa to call home. I can understand the anger of those who claim the stereotype of a racist Cape Town to be founded on prejudice, but I’m afraid I’m reluctant to agree with them. We shouldn’t forget that Cape Town’s urban planning was intentionally premised on the maintenance of social order, which in those days meant segregation of the races. Numerous books and papers detail the history of the City as divided on racial lines, such as this paper from Charlotte Spinks at the London School of Economics (pdf). In addition to academic texts, we have semi-regular accounts of discrimination at certain bars and clubs, and first-hand experiences of racism like those described in Xhanti Payi’s column, published last year in The Daily Maverick. Anecdotal accounts of racism in Cape Town abound, but anecdotes are of course not data. The problem, though, is that we hear far fewer such anecdotes from other cities. And more than anecdotes, existing research such as the Surtee and Hall report (pdf) also appear to corroborate claims regarding racism in Cape Town. And while some critics (including the DA) reject the findings of that report, one could argue that Helen Zille’s response doesn’t properly address the possibility of racism directed at black South Africans, in that it’s largely focused on the facts of integration and equity in the coloured population (I use this term as per Employment Equity legislation, rather than because I think they are sensible). 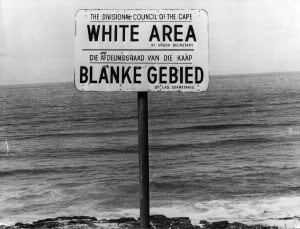 Two entirely separate issues could be co-existing here, and should not be conflated: First, it’s entirely possible – even probable – that the ANC uses the ‘racist Cape Town’ card as a political weapon against the DA, and in doing so might exaggerate the extent to which racism is prevalent in Cape Town. But second, it is also possible that black visitors to (and residents of) Cape Town experience racist treatment exceeding the levels found in other parts of the country. We shouldn’t pretend that this possibility doesn’t exist, simply because we don’t like it. Cape Town does have a higher proportion of whites and coloureds than the other metros. And if racists are everywhere, we could well have more of them here than, for example, in Johannesburg. The facts of this matter could easily be established via a proper survey of attitudes and behaviours across the country, if we cared to do so. Until we do, anecdotes and perceptions are all we have – and the perceptions are real, and no doubt hurtful, to those who have them. In other words, if it is the case that Cape Town is perceived as being racist, this perception is a problem in itself, regardless of the truth of the allegations themselves. And my opinion – right or wrong – is that this perception is grounded in reality. But whether it’s mere perception or not, we’re not going to fix whatever problems do exist – whether racism or the perception thereof – by being offended, or by insulting those who make such claims. Defensive reactions such as these forestall debate. And whether prejudice exists equally everywhere or not, we know it at least exists everywhere. Perhaps, then, the real lesson lies in what Sipho Hlongwane Tweeted at the time, “CPT and JHB are often equally prejudiced. Only one city is honest & confronts this”. Let’s start by making that two cities, and then not stop there. The toilets we have in Nkanini (i.e. the one to five households toilets) are generally in an appalling state, notwithstanding the City’s attempt to maintain same, to the extent that members of the community generally do not use them. They are always blocked and filthy, and are not appropriate for human use. Due to the fact that they are communally owned, people do not take responsibility and personal pride in them. Not only are the toilets filthy and unsafe, but they are a health hazard to people in general and to children in particular as they have burst pipes which are overflowing with faeces. Despite the fact that many South Africans are forced to live in sub-optimal, unhygienic, and sometimes even degrading conditions, Makhaza has become one of the focal points of debate around service delivery in the Cape. By extension, Erasmus’s Makhaza judgement has rapidly become a stick that Tony Ehrenreich is using to argue that the ANC would do a better job than the DA of defending the interests of the poor. This could well be true, although we should remember that the ANC has already had a chance to champion the interests of the poor in the Cape. But while the ANC’s return of 45% of the vote in 2004, along with the 11% of votes garnered by their partners (the New National Party) in that election, brought them to power in the Province, their support dwindled to 32% in the 2009 election. If we are to take the notion of democracy seriously, this indicates that voters wanted to give someone else a chance to govern, and exercised their right to vote correspondingly. That was of course a different time, and the fact that the ANC lost control of the Cape can’t demonstrate that an ANC government in 2011, and Ehrenreich as Mayor of Cape Town, won’t do better than previous incumbents. The chaotic nature of ANC politics in the Western Cape, along with floor-crossing and the death (and now, zombified re-animation) of the NNP – not to mention the short history of democracy in South Africa – make trends difficult to pin down. None of these complications should however obscure the fact that there is a difference between fact and fiction – and in particular the kind of fiction that emerges in the run-up to elections, when selective factual details are plucked out of context and presented as damning evidence for a fiction. In this case, the fiction in question is that the DA government in the Western Cape is somehow at war with the poor, based on the ‘fact’ that they constructed unenclosed toilets in Makhaza. Except, they didn’t – or at least didn’t intend to. What they did try to do was to collaborate with the residents of Silvertown to ensure that they all had enclosed toilets, by spending their budget on providing the toilets and plumbing connections, while trusting the assurances of the community that they would build their own enclosures where necessary. This plan failed, and cynics could argue that it was always likely to fail, or that the demands of dignity for the residents required that this detail not be left in the residents’ hands in the first instance. Of course, we can never know whether the residents would have built their own enclosures, because the City of Cape Town eventually resolved to provide these for the 3% of residents who had not built them for themselves. And then, as we should also remember, they were prevented from doing so by the repeated destruction of the enclosures by the ANC Youth League. You could argue that the DA has been somewhat naïve in their approach to this issue, as they undoubtedly were in the case involving the delisting of the Sowetan journalist, Anna Majavu. There is evidence of such naïveté, in that this was a relatively predictable PR disaster. In the context of the South African sensitivity to class divisions and poverty, an approach which involved a relative absence of paternalism (here, in which services are provided in partnership with the community) was clearly risky. Any failure, at any link in the chain leading to enclosed toilets for all, would always have been spun as a failure on the part of the DA, with the roles of other agents ignored or elided. Worse yet, any protestations of good will on the part of the DA can immediately be spun as further evidence of callous neglect. Sadly, the safest strategy may well be to do the bare minimum – and also to do it in a way which minimises the chances of failure, by swooping in and delivering from on high rather than by attempting to involve communities in their own upliftment. If this is the lesson that Ehrenreich or the ANC want the DA to learn, they might well have succeeded. But in doing so, they could well have simultaneously built a rod for their own backs, because the inflamed rhetoric surrounding the Makhaza judgement makes it appear no less than a capital crime to leave toilets unenclosed, regardless of the circumstances leading to that eventuality. According to Jackson Mthembu, the unenclosed toilets show a “total disrespect for black dignity”, and demonstrate that the DA “is a racist political party”. In fact, the “Makhaza judgment remains a chilling reminder showing on whose side Zille and his [sic] bunch of racist lackeys are on”. 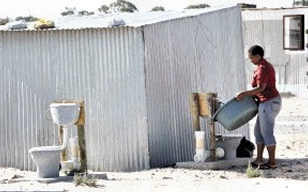 In light of this strong reaction, as well as the claim from Cooperative Governance and Traditional Affairs Minister Sicelo Shiceka that unenclosed toilets would never be tolerated under ANC governance, what are we to make of the unenclosed toilets in the informal settlement of Rammulotsi, in the ANC-run Moqhaka municipality – some of which have been unenclosed since 2001? Or those in Kwadabeka, outside Pinetown in the eThekwini municipality, where the ANC garnered 67.52% of the vote in 2009? Perhaps the real lesson here is the reminder that in politics – and especially, in the weeks running up to an election – facts sometimes simply stop mattering. But perhaps it doesn’t need to be this way, and perhaps increasing numbers of citizens are starting to realise that the truth doesn’t always correspond to the claims made in political speeches, especially when those speeches concern the actions of competing political parties. Let’s hope so, because as with all decisions, those made while voting should be informed by the facts, rather than by faith. And Makhaza is one settlement, in one Province, in one (mostly poor) country. We should ideally cast our votes for who we think will do the best for that country in the long-term, and not simply based on caricature, and misrepresentation of those facts. Democracy and liberty are not equivalent, despite the fact that they are so often conflated in popular discourse. There is no logical obstacle to a dictator being democratically elected and then leaving us with little freedom. Likewise, a dictator could in theory be benevolent, and allow for more freedoms than we currently enjoy in South Africa. This is why being silent in the face of oppression, tyranny, or abuse of power by the state should not be considered an option by those of us committed to both democracy as well as freedoms of various sorts. Fortunately, democracy and liberty are often positively correlated, so that an increase in the one tends to coincide with an increase in the other. As submitted to The Daily Maverick. Yiull Damaso’s painting of an imagined autopsy of Nelson Mandela has provoked outrage similar to that generated by Zapiro’s recent Mohammed cartoon. The outrage is similar in its severity, and unfortunately also similar in its knee-jerk thoughtlessness. Most troubling, the similarities extend to having to hear yet another argument in favour of the censoring of free expression on the grounds of cultural or religious sensibilities. 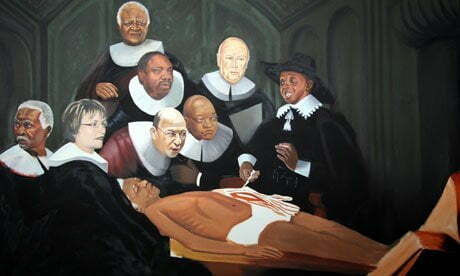 The painting, adapted from Rembrandt’s “The Anatomy Lesson of Dr Nicolaes Tulp”, shows a deceased Mandela being autopsied by Nkosi Johnson, while FW de Klerk, Helen Zille, Desmond Tutu and others look on. It is, of course, the portrayal of Mandela as deceased that is causing most of the consternation, on the grounds that this portrayal consists, variously, of witchcraft, disrespect, a violation of dignity, and a “insult and an affront to values of our society” – at least according to ANC spokesperson Jackson Mthembu.